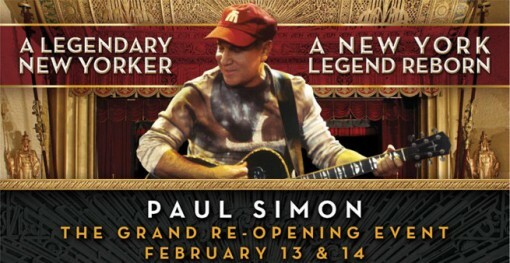 Tickets for Paul Simon at the grand re-opening (I didn’t know it had closed) of The Beacon Theatre go on Amex presale starting Sunday, January 25 at noon. General public on sale starts Sunday, February 1 at 10 AM. So now that The Beacon has been renovated, does that mean that they will be booking younger acts? From the looks of the first two big shows, I guess the answer is no. Sure Paul Simon is a big draw and a local hero, but I think maybe Leonard Cohen would have been a better choice (well at least he would have been a much more daring choice) to re-open the theatre.